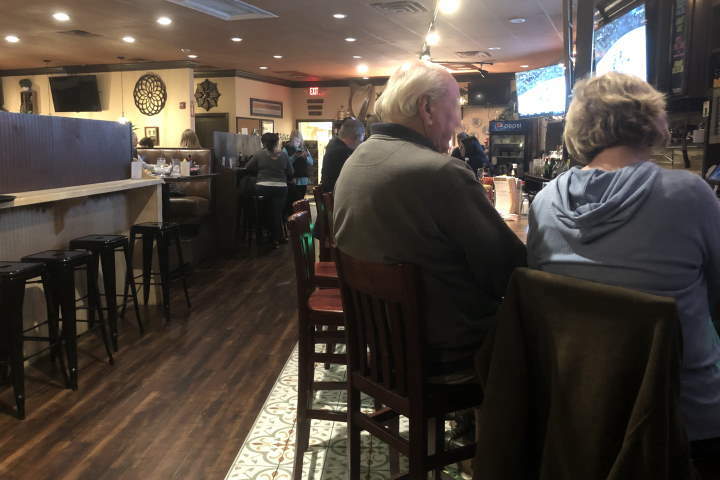 For a relatively small town, Walpole certainly has its fair share of restaurants and bars, including a couple of Irish pubs, one of which is just south of the town center and the other being in the heart of the center. And while both of those spots serve good food and well-poured pints, lovers of Irish pubs should not overlook another spot in this southwestern suburb of Boston, namely Finnegan's Wake, a basement-level pub behind Walpole Center with lots of character--and that is nearly impossible to find unless you happen to know someone who knows the place. One reason for Finnegan's Wake's appeal is the fact that the pub is located in an old foundry in an area behind the center that has a distinctly industrial feeling. The entrance is by way of an old wooden porch and a staircase that leads down into the restaurant. The center of Finnegan's Wake is a small bar, with a dining area (as well as a small room to play darts) off to the left side of the bar. To the right is a quieter, more private dining room with windows a good distance above the tables and a fireplace that doesn't seem to be in use, but adds a nice touch to the room. This dining room has several tables (including high-top bar tables as well as more traditional dining tables) and is partly partitioned off from the rest of the place, making it a better option for families and others who might be looking for peace and quiet, though the bar area typically is pretty serene. As is the case with most Irish pubs, the menu at Finnegan's Wake includes mostly familiar dishes; for instance, a thick, meaty chili, nicely marinated steak tips, an open-faced roast beef sandwich complete with lots of gravy, a variety of panini (including tasty ham and Swiss cheese panini with onion strings inside the sandwich), rich-tasting fish cakes with tartar sauce, Guinness beef stew, an absolutely huge shepherd's pie, and fish and chips can all be found here, as can burgers, pork chops, and some particularly good fried chicken that almost tastes broasted, with a dry and crusty exterior and a moist interior. Finnegan's menu does, however, have an item or two that you might not find in all Irish pubs. The hearty turkey dinner, for instance, is something you would more likely find in a classic diner, while the liver and onions dish is an acquired taste that the more Americanized Irish pubs don't always have. And then there is the humble toastie; yes, Finnegan's Wake has this beloved grilled ham, cheese, and tomato sandwich that can be found in nearly every pub in Ireland, but is not easy to find in Boston-area pubs. It might not be exactly like the heavily buttered and often cellophaned sandwiches across the pond, but it is very good. Desserts are worth looking into at Finnegan's Wake, with the carrot cake and chocolate lava cake being two tasty options. Finnegan's Wake is a real hidden gem that locals tend to frequent, but folks outside of Walpole generally don't know about. The food is good, the prices are mostly reasonable, the service is friendly and efficient, and there is plenty of street parking in Walpole Center, which is a short distance up the hill from the building. Sure, the other pubs in town are definitely worth checking out, but if you like to go to places that feel like no one else in the world knows about, Finnegan's Wake will probably fit the bill. Copyright © 2008-2016, Boston's Hidden Restaurants (www.hiddenboston.com).